Well... so here it is. I figure since this is my second sump, I would document how I went about making it. I noticed that many newcomers to the hobby are curious to see just HOW to make one of these... so here goes. First... I decided on all glass. 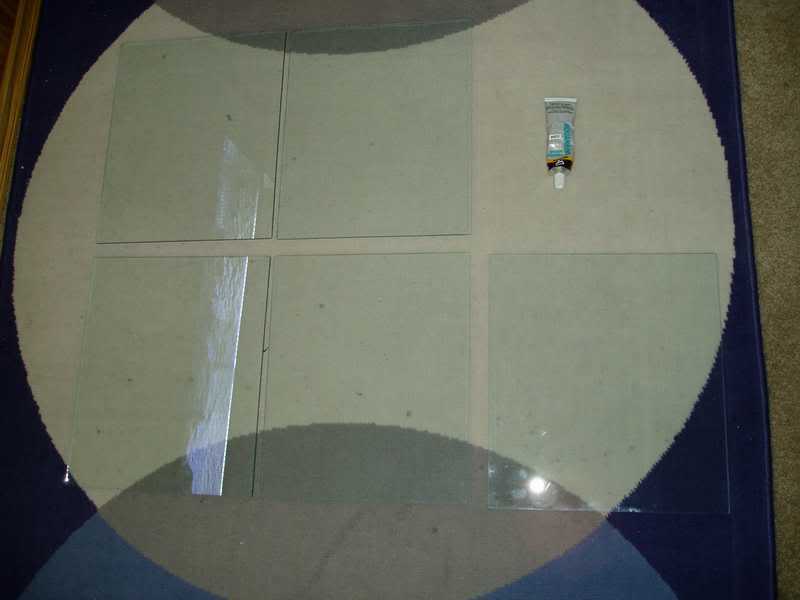 40 gal tank (glass) and 3/16" glass cut from a LGS (local glass shop). I just had to measure EXACTLY how wide the baffles should be to fit inside, and decided on a height. Mine came out to 14.5 x 12". Total cost: $30. 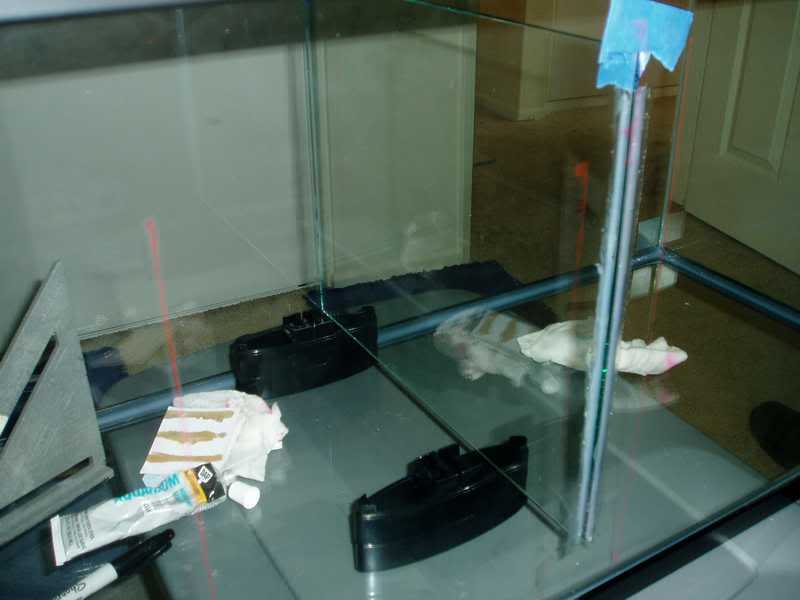 I layed out with a dry erase marker on the outside of the tank where I wanted my baffles to be, making sure that the other side was identical (so I could make sure the baffles were square). Next... make sure you take the kittens out of the room, because they are bugging the heck out of you. 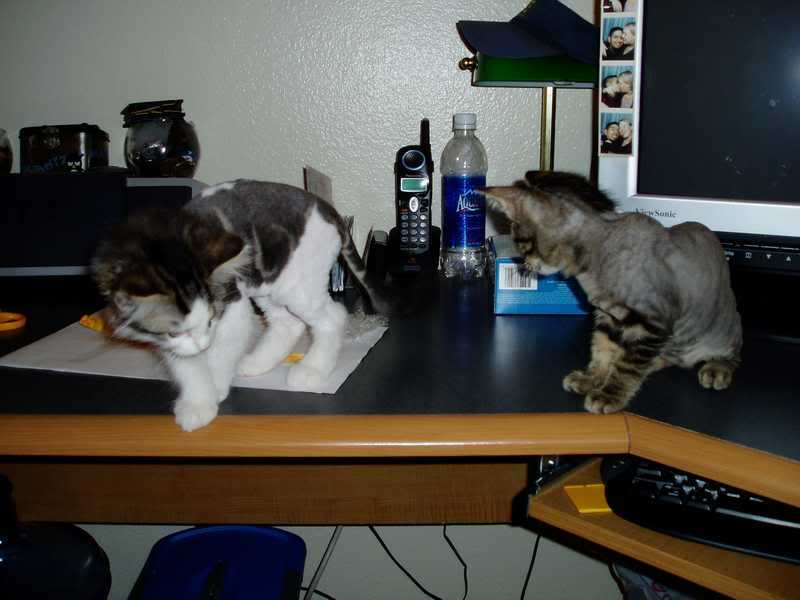 (kittens just got neutered... and shaved. (not a part of the diy sump project... just needed to provide a break for all you's taking notes). When you get to the baffle portion of the sump, make sure you do the top baffle (the one in the middle) FIRST... or else you won't be able to properly silicone the sides of it. This is important because the only thing holding this one up is the silicone itself... all the others are just merely sitting on the bottom. Prop it up at your desired height with whatever you find. 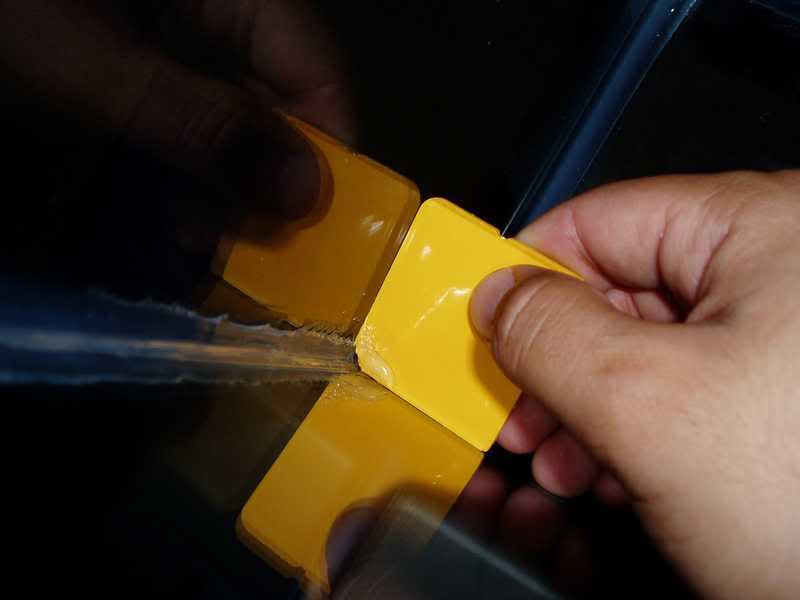 I used pieces of plastic that were used to hold up a monitor. Just make sure that you pick something that can be pulled out from underneath when it is dry. Now, I decided to have a compartment for a fuge. That's the one all the way to the left. My sump is configured to be: (flowing from right to left) LR Rubble compartment, then the skimmer, then the bubble traps, then the pump compartment. I'm going to put a "T" valve on my mag 9.5 to feed the fuge, which I had cut 13" instead of 12" so that there was no way water could get in there that was flowing too fast. I'm also going to add in a strainer so that the surface gets skimmed, and all the good stuff is left in the fuge. When I get back in from work, I will xfer the LR Rubble, and fix the plumbing for my new fuge. Also, since my skimmer compartment grew in height by 5 inches, I need to compensate by raising my skimmer by 5" as well... I will need to find material to raise it properly. More updates to come! Very cool. Looks great! 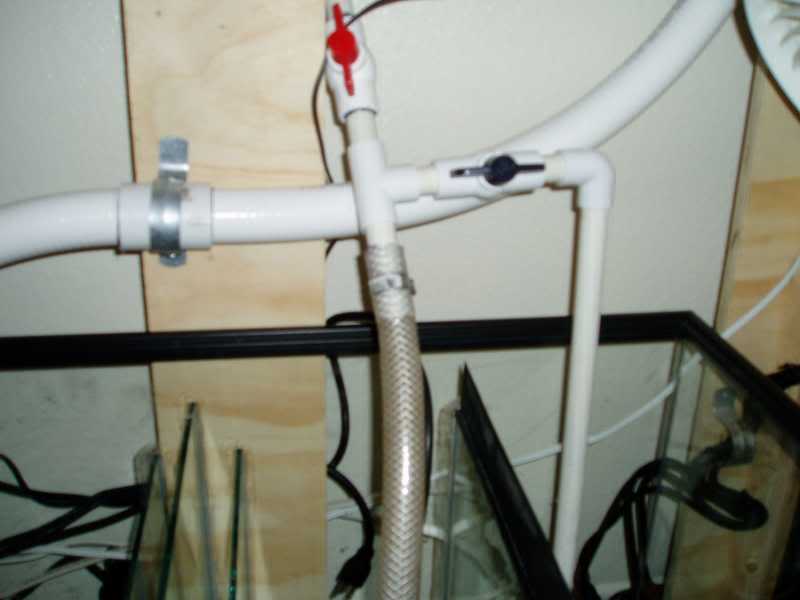 an easy way to raise a "sit in sump" skimmer is to cut a sheet of egg crate the same size as the bottom of the skimmer and then super glue 4 PVC legs the desired height to it. Thats how I support my EV-120. 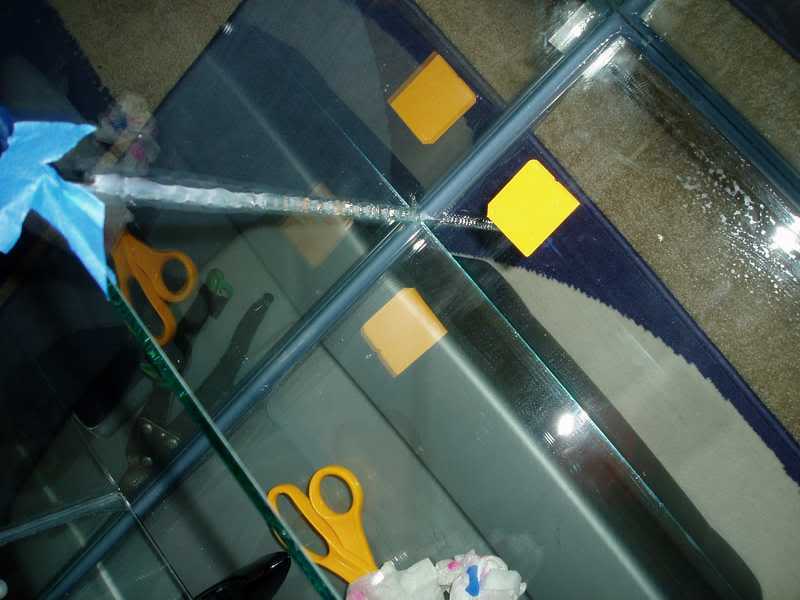 cut a sheet of egg crate the same size as the bottom of the skimmer and then super glue 4 PVC legs the desired height to it. Exactly what I was going to do! haha. Taking the wind from my sails already! THIS IS GREAT!! YES I'M SHOUTING!! I'm such a do-do bird when it comes to DIY - I need something seemingly simple in pictures in front of me to really see how to do it. So THANK YOU for posting this. 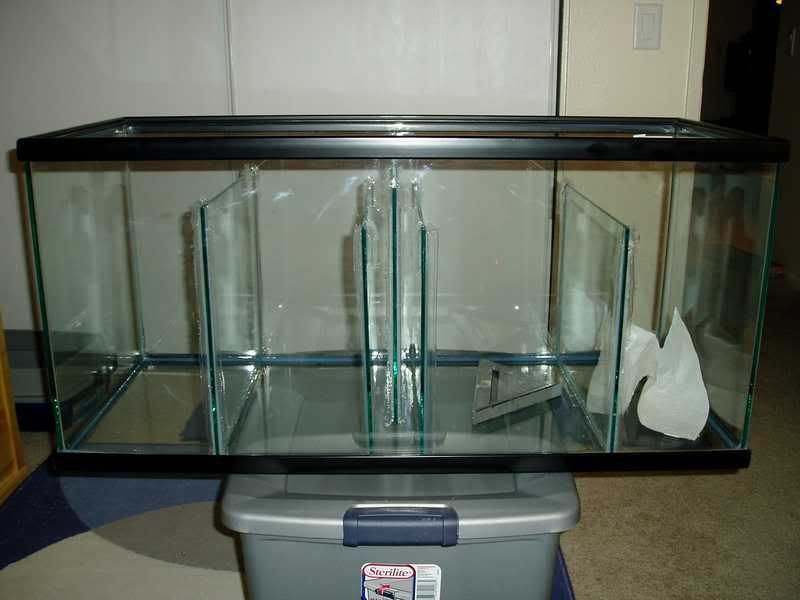 I'm actually getting my 20L glass tank today and was going to work on adding baffles...and was, well, baffled. It really is simple, just like everyone says! AIPTASIA to choke a horse. UGG. Kay... well it's pretty much finished! Just filled it today, added sand into my fuge, and raised my skimmer. All of the plumbing was glued up and no leaks were found! 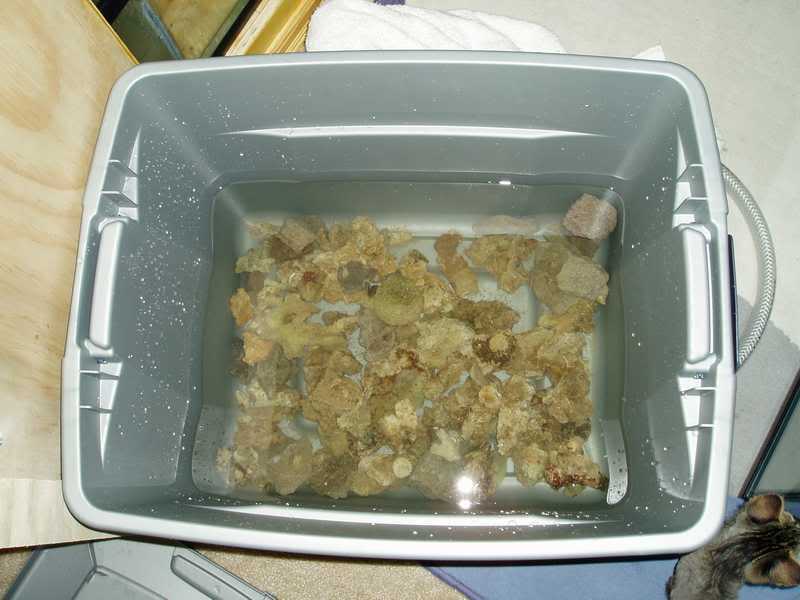 Here's all the rubble that I took out of my sump... about 20 lbs. When you're doing this kind of setup with a built in fuge, make sure you put two separate ball valves to control how much flow goes into your main, vs how much goes into the fuge. I drilled several large exit holes on the fuge side to prevent a hole being blown in the sand. Here is the final product! The water is still a little cloudy... I'm waiting for the sand water to calm and settle before I add it into my main system. 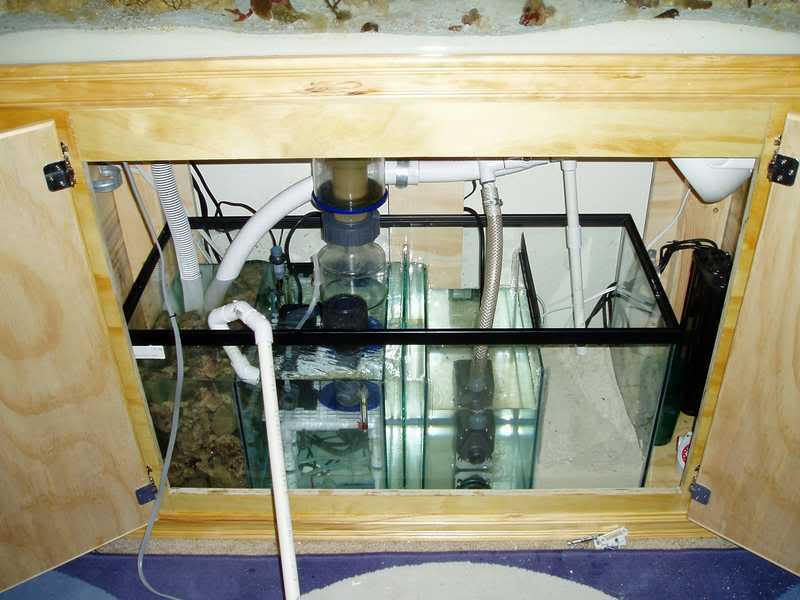 Just make sure that before you turn the main pump on, make sure to have a decent supply of ready made saltwater to add to the sump as the pump runs for the first time. The plumbing will take water to fill up, and if you're not careful, you could have your pump running dry. 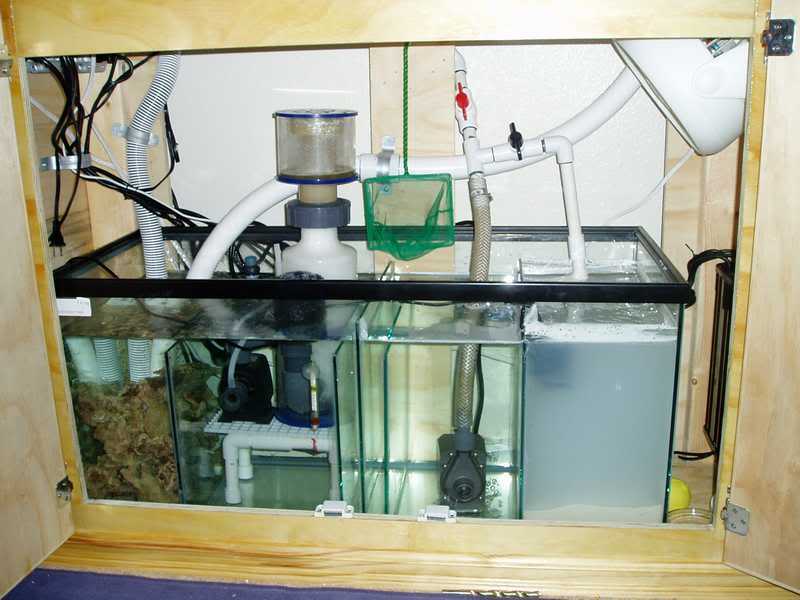 When starting up for the first time, I just let the pump run, and slowly add in enough water to compensate for this factor until the water line in the sump stops dropping. This project was fun as heck to do, not to mention easy!! Now I can double my LR rubble capacity, and increase the size of future equipment if I choose to upgrade my 60 gal to a 120+ in the future. 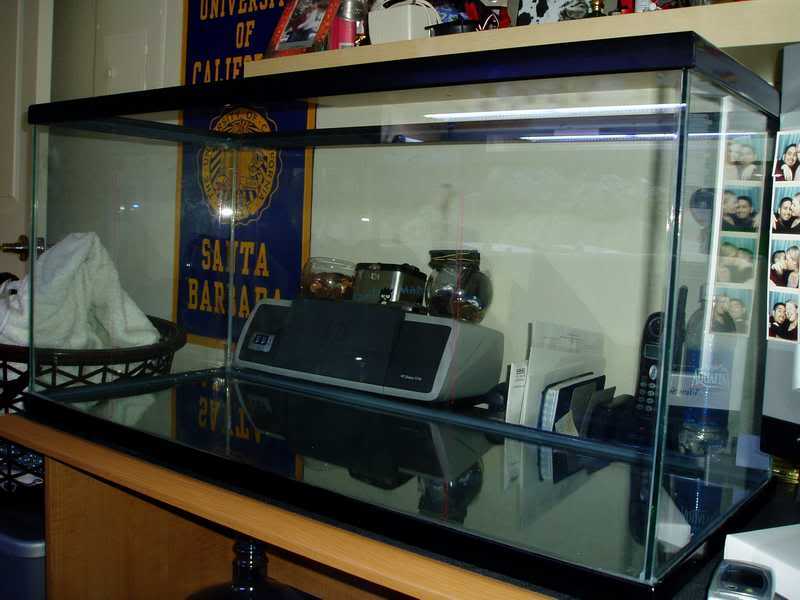 Total cost: Tank $50, Glass $30, Sealant $4. 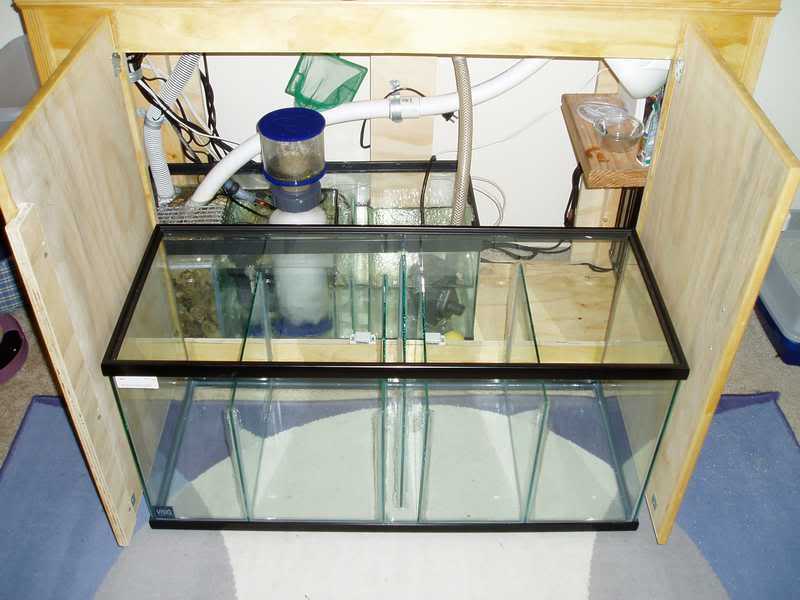 Bigger sump to make life easier and incorporate a new fuge - priceless. Very Nice Work! Great Documentation. This will be very helpful to many people....Great Job Rob! great post! And the sump looks well built to! One question though. I didn't see any mention of a power off test. Have you turned off the power to see how high your water level rises? if a pump fails or the power goes out all that water in your plumbing will settle back down into the sump. make sure that when that happens you wont get a flood! Yeah... forgot to mention that. I did test it 3 times and all was well. Water only raises one inch on this thing... it used to raise 2.5" on my old 20L. My 4 return lines are verrrrrrry close to the surface to they ripple the water, but not high enough that they sound gurgly with air. It doesn't take more than a few seconds for water to be introduced to the mix, shutting off the backflow siphon.